History shows that the shape and form of what we see and hear does work on our cognitive understanding of the world. This movement is not entirely about the graphic. It is about the perception of disability in the public space. It is about a cultural change in the way disability is understood. Sara Hendren and Brian Glenney co-founded The Accessible Icon Project, designing the new icon with Tim Ferguson-Sauder to display an active, engaged image with the focus on the person, not just the disability. Original Icon - Mechanical. Static. The original design was developed in 1968. New Design: Leaning forward. Sense of movement, self-navigation through the world. This version of the symbol is officially used in the states of New York and Connecticut and the City of Phoenix. It is in a permanent collection at the Museum of Modern Art. There are hundreds of pictures showing the accessible icon already in use across the country. 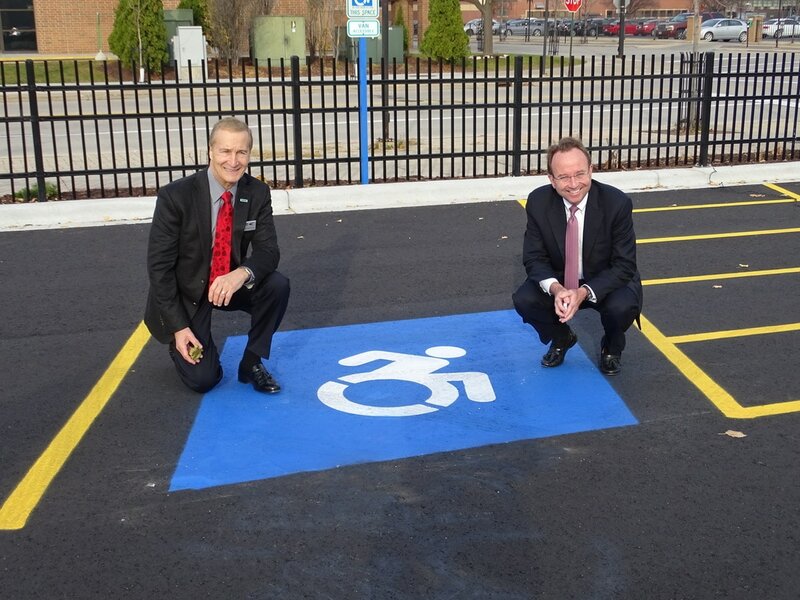 To the right, Rick Chernick of Camera Corner/Connecting Point and Phil Flynn of Associated Bank are the first businesses to bring the icon to Green Bay in their joint parking lot off of Main Street. Let's make Green Bay the first Wisconsin city with the new Accessible Icon! Resurfacing your private lot? Contact Nicole at 920-593-4330. The No Limits campaign will provide you with a parking lot stencil for your asphalt company to use. In addition, you can request free accessible icon stickers to use on your existing parking signs OR we can refer you to a local sign company that produces the new accessible icon parking signs. Learn more about The Accessible Icon Project at www.accessibleicon.org.